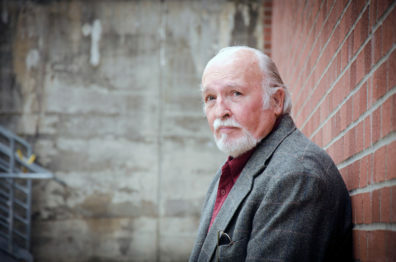 Russell Michaelsen didn’t graduate from the WSU College of Nursing until he was nearly 50, after working as a medical lab tech, logger, commercial fisherman, hunting guide, and builder. As a nurse, he added inventor to that list of vocations. His company, based in the Health Education & Research Building on the WSU Spokane campus, specializes in development of products designed to prevent infections. 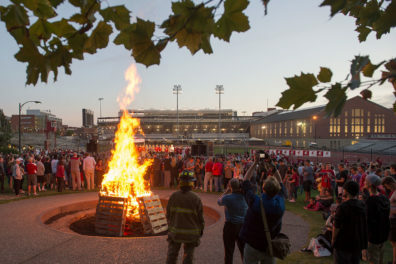 With over 350 registered student organizations on the Pullman campus, WSU relies on many faculty, staff and graduate students to advise these groups. Spend quality time with your Cougar family before the game and take advantage of affordable food options, including Cougar Smokie Sausage, Cougar Gold mac and cheese, turkey and brisket sandwiches, hamburgers and more at the CUB before Saturday’s big game. Lambert Ngenzi wants to use what he is learning about geospatial analysis to help farmers in rural Africa conserve and manage vital water resources. He already has participated on an international research project improving water reservoirs in Ghana and Burkina Faso, a role he would have trouble envisioning for himself just a few years ago as a war refugee. The first major steps toward focusing on interdisciplinary excellence were taken in the autumn of 1919. Researchers at WSU’s College of Veterinary Medicine are seeking 13 healthy cats to help study whether the antacid, omeprazole, reduces the effectiveness of clopidogrel (Plavix®). Clopidogrel is commonly used in both human and animal medicine to prevent blood clots. WSU cello professor Ruth Boden is challenging the received wisdom that classical music is played in tuxedos in concert halls with whisper-quiet audiences who’ve paid big bucks for a seat. The College of Veterinary Medicine is looking for 60 healthy dog volunteers to help in a study of the effects of antibiotics on the bacteria found in poop. In the late 1930s, the WSC Creamery wanted to find a new way to store cheese. Wax cracked easily and plastic hadn’t been invented. Did you know the cider apple research program was started at WSU Mount Vernon NWREC in 1979? After 38 years with WSU, artist Tim Doebler’s creations have become interwoven throughout the university. Commemorative and recognition placards in building lobbies. A stone monument on Terrell Mall. Finely crafted tokens of appreciation awarded to University leaders and supporters. And, of course, the ornate university mace, a fixture at every convocation and commencement. The official WSU mascot can trace its origins to an October 25, 1919 football upset over the heavily favored California Bears. Friday night’s 30-27 upset win over fifth-ranked USC thrust WSU into a national limelight that continued to shine throughout the weekend as the Cougars climbed to No. 11 on the latest Associated Press Top 25 poll. 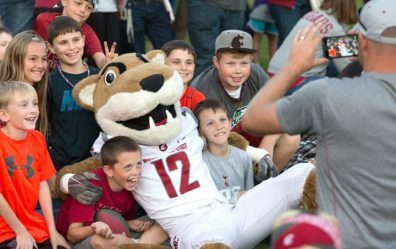 A sampling of reactions, from ESPN to the Washington Post, suggests others are discovering what Cougar Nation already knew has been building on the Palouse. Hacktober Trivia Game is here! Win weekly prizes with daily cyber trivia questions from ITS throughout October. Show off your WSU pride with the help of this Coug‑o‑lantern stencil.